Hello, friends! From here on out, I’ll be periodically reading a tarot or wisdom card intended specifically for those who read the post. I trust that your spirit has directed you to it at the perfect time for you. Each time, I will be using a card from one of two decks: Wisdom of the Hidden Realms by Collette Baron-Reid or The Fountain Tarot by Jonathan Saiz, Jason Gruhl, and Andi Todaro. This card is in the upright, or Ally, position. 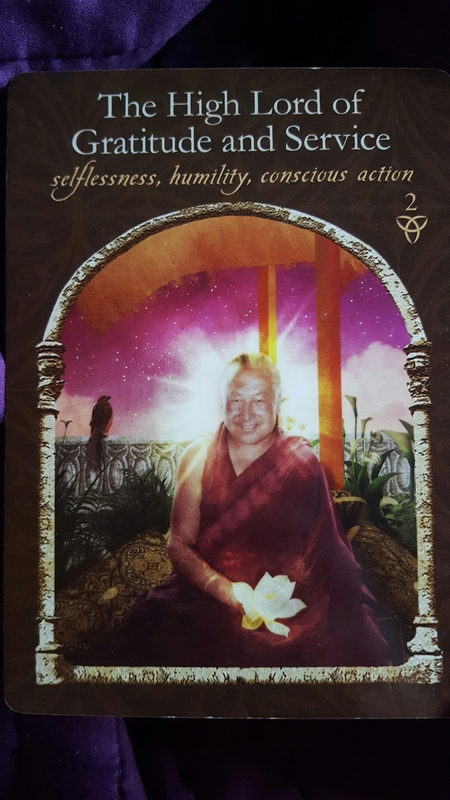 On this card we see an elderly monk who is calm and happy. He is seated in a meditative state and is holding a lotus blossom. He has given his life in service and is now in a state of bliss or serenity. This card reminds us that if we cultivate a practice of being grateful in each moment and of giving with a spirit of love, the quality of our lives will improve tremendously. Giving produces joy in both the giver and receiver. Gratitude causes our hearts to overflow. It’s a wonderful positive feedback loop. We give and we are thankful for receiving. Over and over again. May we remember to be thankful for everything, even for those things we think are “bad,” because all things can be our teachers. May we remember to be grateful for our bodies and all their systems, which work constantly on our behalf. May we remember to have open hearts and listen for our inner voice when it reminds us to give joyfully to others. Take time today to sit in gratitude for your life and your body, and for all the people who make your life better. BONUS: Think of one person that causes you anger or frustration. Spend some time thinking of things about them for which you can be thankful.